When Stanley Woolferstan was just 16, he went alone to Canada to take up his first job - a lowly position in the Bank of Montreal. Almost as soon as he arrived on the other side of the Atlantic, war broke out in Europe and immediately, he tried to enlist. But he was too young and it was not until 1915 that he arrived back in the UK. The Bank had been so impressed by his attitude that they obtained for him an officer training place at Sandhurst. He passed out in March 1916 and was attached to the 1st Battalion of the Dorset Regiment. 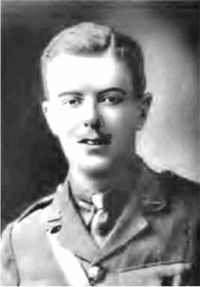 Early in 1917, his Battalion was sent to France. He died 8 weeks later, having led his company in a successful attack near St. Quentin. He was just 19. The First World War produced a social change which hadn't been foreseen. Historically, leadership had been the prerogative of the ruling classes - they believed it was what they were put on earth to do and sent their sons to schools and colleges which made no bones about claiming that, first and foremost, their pupils would be trained to lead - irrespective of ability, inclination, intelligence or practical skills. In spite of the changes made after the Crimean War, when war broke out in 1914, the higher echelons of the Army and the Navy* were still almost entirely composed of men who came from aristocratic or upper class families. It was unthinkable that it should be otherwise, that men from the middle or working classes might be fitted for any other function than to take orders from their "betters". Equally unthinkable was the idea that the upper classes should obey orders issued by those who they considered to be inferior to them in the social order. There was no conscription until 1916 so that all men who came forward to fight were volunteers. Regardless of class, many volunteers were better educated than the men they were required to serve under. Grammar and Technical schools had encouraged them to use the dictates of their own minds, initiative and common sense to govern their actions and they were destined to become a new kind of officer, rapidly gaining the respect of the men who fell in behind them. And plenty of vacancies had been created for them to fill due to the appalling casualty figures. By 1916, the War Office had no choice but to face the fact that the cream of a generation of upper class officers lay beneath the mud of Flanders or below the waves. From then on until the war ended, they had no choice but to look into the ranks and promote the most promising volunteers and recruits they could find. Age was no barrier - as one reads through the details of Devon's officers who died, one is instantly struck by their youth - 18 and 19 year olds leading their companies into the height of battle with the coolest courage after just a few weeks of basic training. And what of those "new" officers who survived? Did they gain the respect and gratitude of the Nation when the war was finally over? They most certainly did not. Old newspapers from the 1920s are full of stories about the reception these men got when they returned home, in particular the problems they experienced in returning to employment. Many of their previous employers were very reluctant to take them back because they feared the very skills which had made these men good officers. Those who occupied the top places within the British class system wanted everything to return to the way it was. They believed it was the function of those beneath them to serve their interests - to do manual work, to act as servants - in other words to know and keep their lowly place in society. But leadership? No, very definitely not. This was not required from them any more. There were speeches at public functions about the problem of dealing with these unemployable "uppity" young men who came home wanting a better place in society than they had a right to expect. There was even criticism of families who openly boasted about the contributions their sons had made - to some, it seemed unthinkable that a blacksmith or a railway porter should compare the actions of his son with those, say, of a peer of the realm or a great industrialist. But it was too late - the old order had changed for ever. *The Royal Flying Corps (RFC) began in May 1912 under the command of the Army, its main duties being high-level reconnaissance, largely from tethered balloons. However, the Germans put a lot of money and effort into building up an aerial force which could fire guns, grenades and bombs from above the battlefield. It was to counteract this that the RAF (Royal Air Force) was founded in April 1918.